You are a powerful spiritual being in physical form. In this channeled angel course you will experience returning to and maintaining the authentic vibration of your soul and higher self. Your natural state of being is high vibrational, and yet it's easy to get pulled into the lower vibrations of the physical realm. In this course you will cleanse and refresh your energy so you can reconnect with the diamond light of your higher self and authentic truth. You will also learn simple techniques for maintaining your authentic vibration. When you do stay in your authentic, high vibrational energy signature, your destiny naturally unfolds before you. You are able to live in increased love and joy by simply being in alignment with the high vibrational truth of who you are. When you do this, you not only improve your own life, but you naturally overflow healing and vibrational blessings to benefit all. 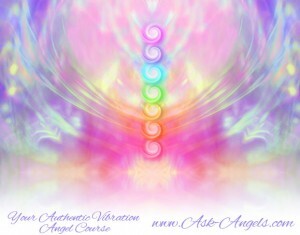 This course contains 4 angel course components channeled by Melanie and set to the meditative music of Thaddeus. Remember, you have no risk by ordering this product thanks to your 30 day money back guarantee! If you don't love this course, or feel like it has worked for you, simply email me requesting a refund and I will happily refund 100% of your purchase price! Curious What Others Have Said About This Course? “This was absolutely fantastic. I am so grateful. The best healing I have ever had !!!!! Commenti your messages is lovable but right am financially down and I don’t know where to have money in order to purchase at least one. Melanie, you are doing a wonderful job out there. Thank you for being my spiritual guide. You can stream the components directly onto iPad… Alternately you can download them to a computer and transfer to your iPad via iTunes… Downloading .MP3’s directly to iPad is blocked by apple… But with the two options above you still have full access! Hope this helps!